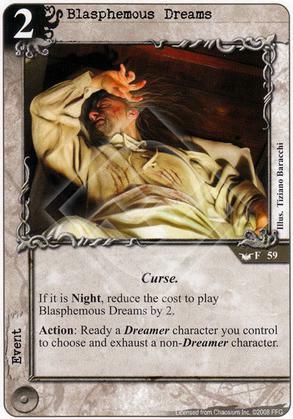 With only 20 dreamers in the card pool, several of which are not worth playing, it can be difficult to construct a deck that can reliably use this card. Even without the dreamer restriction I would struggle to fit this into any of my decks. 0 cost to stand a character and exhaust one of theirs? Auto include in night without the restriction. With the restriction, auto consider as long as you have 2 or more dreamers in your deck, or tech to make them. Note that readying is a cost, therefore happens even if the event is cancelled. I wish the Dreamer restriction wasn't on this, because it would be so much more flexible. If you're building a deck around Dreamer synergy, this can be a great card, but otherwise it's basically unplayable, which is a shame.